Nektar’s first album of new material in four years finds the band in fine form. The pair of original members (main songwriter, vocalist and guitarist Roye Albrighton and drummer/bv Ron Howden) have been joined by keyboardist Klaus Henatsch and bassist Lux Vibratus – although the latter appears to have come onto the scene after the album was recorded as the versatile former member of Yes, Billy Sherwood, has not only played bass, but provided his studio and technical expertise for the recording: and it certainly sounds a million bucks! Aficionados will surely enjoy the melodious ‘Destiny’ – a slow-ish song with emotive guitar and vintage keyboards; it’s a wonderful tune and comes complete with a magnificent chorus. The lengthy ‘If Only I Could’ is a piece with umpteen separate phases that brings with it more than a hint of early Genesis, while the title track brings forth waves of sound and some really super Hammond organ from Hanatsch, and the superb keys in the following track ‘Tranquility’ are also worthy of mention. It should be noted that this is not a concept album based upon the H.G. Wells novel, and nor are the individual tracks precisely thematically linked. 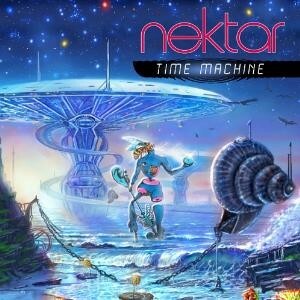 It does, however, reinforce Nektar’s apparent preoccupation with “time”. This is an album of fun prog rock, featuring consummate musicianship and many sections of splendid vocal harmonies, and is another release I can warmly recommend to anyone for whom my comments resonate.